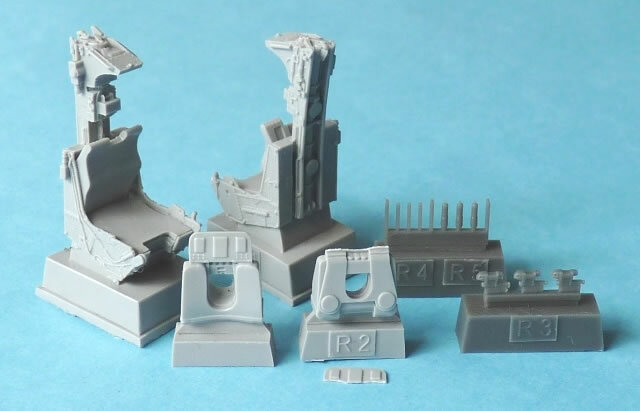 Advantages: Incredible detail; flawless casting with the removable plugs located in sensible areas; additional photo-etched parts for embellishment; colour printing for the p-e was in perfect register. Conclusion: These releases give the modeller a chance to enhance their chosen subject with very little effort. Every item is an improvement on its plastic counterpart and the substitution is simplicity itself. The cockpit of a jet is a veritable magnet for inquisitive eyes. Hasegawa’s Phantoms have been around for a long time now and a couple of items that can benefit from some extra detailing are the “bang seats”. Modeller’s who build USAF F-4s will welcome this set as it contains a vastly improved version of the Martin Baker MK.7 H7AF. 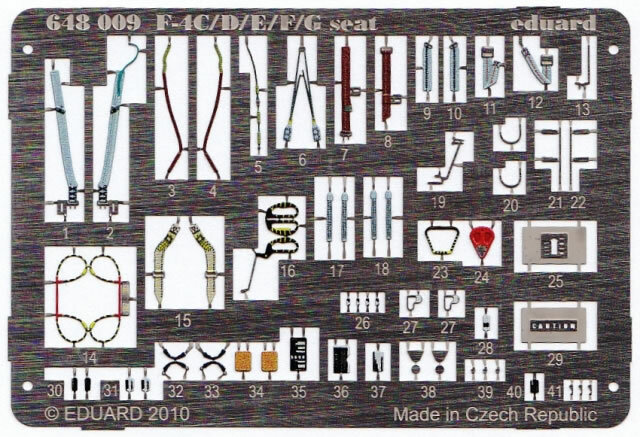 Naturally 2 seats are catered for and we get a duplicate set of resin and photo-etched parts to accomplish this. The latter item was printed in colour and the registration is perfect. There are a lot of very small parts here so take extra care when removing them. Also included is a stencil for the “caution” and “lift here” warnings. 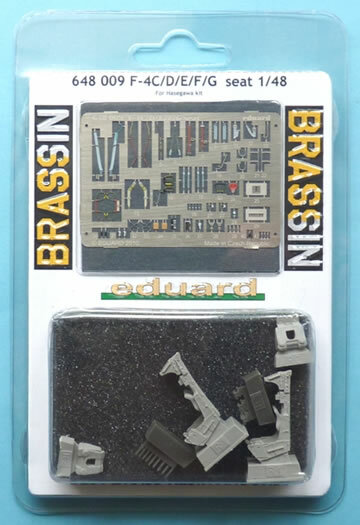 As expected, the casting of the resin components is first class with fine detail and a flawless finish. A couple of A5 sheets of paper give you a good indication where everything should go, although the fastidious will seek out further information regarding the exact placement of some items. The Phantom theme continues and once again it’s the Hasegawa kit that takes the spotlight. 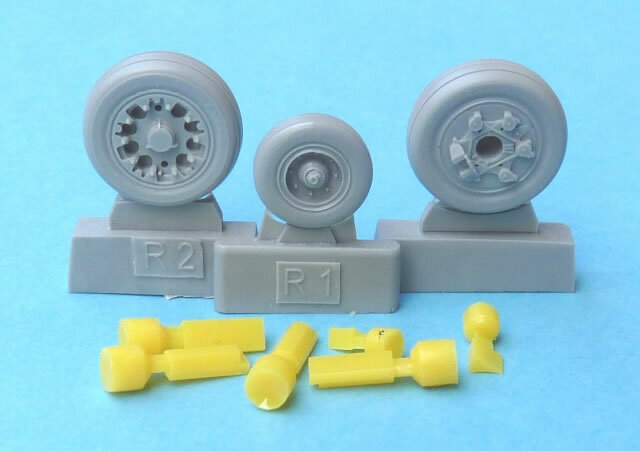 These wheels are for the Airforce variants and as such covers the F-4C/D/E/F and G.
The equivalent plastic items are always missing out when it comes to depth of detail. These items rectify this. The casting is so good that one can even read the Goodyear “advertising” on the side walls. A small sheet of “paper” masks is provided for the tyres which a thoughtful addition to help in the painting process. 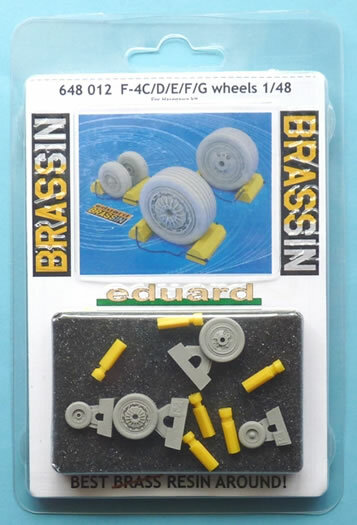 Another bonus is a set of wheel chocks which will add a nice touch to any diorama. The comments above are also relevant to this set of wheels. They have been designed to replace those found on the Kinetic F-16A/B kits. Once again the level of casting is outstanding and here we are graced with a fret of photo-etched parts that detail the surfaces of the inner hubs. 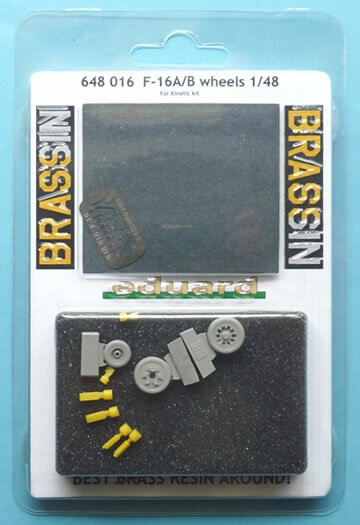 The different style of wheel chocks will again satisfy the diorama builders and the welcome masking set completes the package. All of the above are packaged to prevent damage in transit. The resin is protected by a piece of foam and the contents are sandwiched between two halves of tough clear plastic. Occasionally an item may find room to try and rattle itself to death...as seen in one of my examples. Fortunately the break will usually be in an area that is easily repaired and in this case the part will make a full recovery. The detail incorporated into these castings is impressive and those items that require embellishment have the advantage of photo-etched parts. With the addition of these releases, the modeller can’t help getting a superior result with very minimal effort.